The evidence is abundantly clear. Kathryn Hill is a natural born mystery writer and a true child of the South. She weaves a deft plot into a thrilling twist of an ending in her first novel, Express Malice. Born at Baroness Erlanger Hospital in Chattanooga, Tennessee (she jokes that she was a victim of circumstance – her mother was visiting family at the time), she spent most of her growing up years in Atlanta. Kathryn’s father, Fred Underwood, was the master of many mechanical and engineering talents while her free spirited mother, Mydoline, was an eager accomplice in his ingenious exploits. They were a daring and adventurous couple. Kathryn as a young girl was never dull! There was always a new exploit on the horizon. Fred moved his family to Chicago to work for Spartan Trailers (the predecessor to Airstream) and after spending one icy wintry season up north, the son of the south packed up their new Spartan trailer and the family moved to Orlando. Fred hand built a dozen electric boats, and they settled in for a couple of years near Lake Ivanhoe. Missing family and still looking for a challenge, Fred packed up the Spartan and moved them to Atlanta. So another adventure began. Fred became the new owner of Crane Auto Parts and Salvage Yard, a great heap of challenges for this creative man. While Fred began to build the business, Kathryn’s life was changed forevermore. At Thanksgiving, her parents forced a sister upon her after being an only child for six years; then they uprooted her from her neighboring grandparents to move yet again – to a South Georgia town called Albany. It wasn’t all bad, however, they did live in a vacant roadside motel for a week and Fred taught her how to operate a winch on a “pole truck” in the Radium Springs Road junkyard! Two years passed before they were able to pack up the Spartan and move back to Atlanta. Life began to be normal – or at least as normal as it would ever be for the Underwood family. A nice little green asphalt shingled house in the suburbs was purchased. Fred and Mydoline chose DeKalb County because at that time the school system was rated as “best in the nation”. Oh, did we forget to mention they found yet another baby sister shortly after their return to Atlanta? Now there were three. Briarcliff High School was quite an experience for Kathryn. Participating in extracurricular activities required that her grades be maintained and that school wasn’t just a social gathering place. She now was required to have a part-time job. According to her parents, you must learn to work as well as read and write! After school, weekends and summer days were spent working at Holiday Shoes, the architectural firm of Straiton Hard & Leon Lovett, and later at a Decatur law office for Tolbert “Tom” McGhee Allen, Jr. of Allen & Baker. 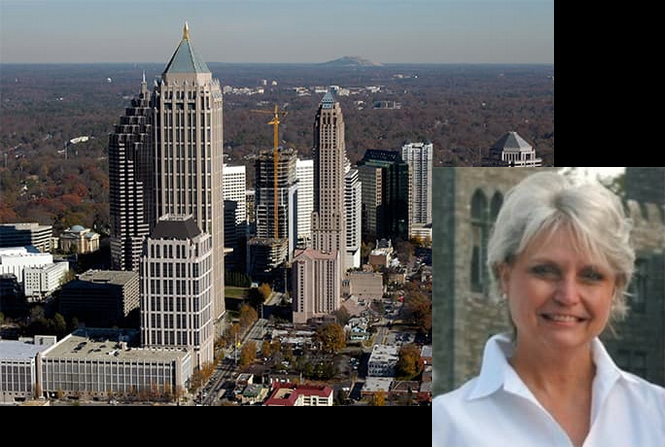 Tom Allen became a great mentor to Kathryn, letting her tag along to federal court in downtown Atlanta and teaching her where the “real lawyers hang out for lunch” such as Leb’s on Peachtree. Kathryn’s interest in law developed quickly. She learned her way around the old courthouse on the square in Decatur and discovered there were only two women lawyers in DeKalb County at that time – Katherine Mann and Ruth Echols. She was inspired. Unfortunately, an early marriage and divorce delayed her career and left her with two young children to raise. With the help of her family (and Tom Allen), she was able to go back to work full time, attend evening classes at Georgia State University and graduate from Atlanta Law School with her LLB and LLM in Taxation. Kathryn always enjoyed a variety of non-judicial interests (taking a page from Fred’s playbook that you should never limit yourself). She owned an art gallery, a frame shop, an event management company and even a group of house painters (that is a whole book it and of itself). She has been a design consultant, raised a family, and somehow managed to tour the world with her late husband, Charlie, a Delta Air Line pilot. She brings international, as well as southern charm to her work. This tiny dynamo currently resides in North Georgia where she revels in gracious entertaining, indulging her grandchildren and expertly plotting her future thrillers.